Sleek, silver, and slim, the Tag Heuer Men’s CAF2111.BA0809 2000 Aquaracer Automatic Chronograph Watch is a power-packed diver’s watch with a delicate and elegant style. The timepiece’s white dial, silver hands, and silver band give it a uniform look, pairing well with any attire. 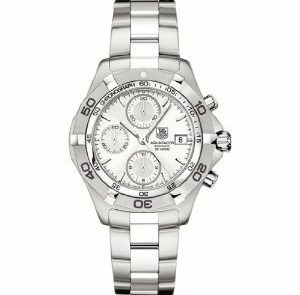 While Tag Heuer’s Aquaracer line is designed to handle the impact of diving and water sports, the luxury design of the watch makes it appropriate for business or casual wear. 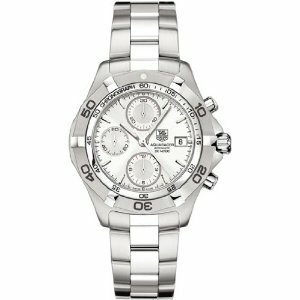 Pros: Tag Heuer is known for its quality and style, and this Swiss-quartz movement timepiece is not short on either. The sapphire scratch resistant crystal keeps the dial readable a sharp-looking, no matter what is it being used for. The three mini-dials on the face and the date on the right hand side of the face makes the Tag Heuer Men’s CAF2111.BA0809 2000 Aquaracer Automatic Chronograph Watch comprehensive as well as modern-looking. The silver hands against the white face of this watch make it easy to read, as opposed to silver-on-silver watches, which can be stunning but hard to register. The Tag Heuer Aquaracer CAF2111.BA0809 offers a nice balance for the businessman who can appreciate the luxury aspect of a high-end watch, but likes to mix business with pleasure with activities out on the open sea. Cons: While the Aquaracer CAF2111.BA0809 offers the face of luxury for the diver, the practicality of such a watch for someone with a desk job comes into question. While the dial is protected with scratch-resistant sapphire, the polished wrist band is not and may get scuffed easily through normal daily use at a desk-job. This Aquaracer has a fold-over clasp, rather than a safety push button clasp that is more durable and secure on oceanic expeditions. If you want more security in your clasp, the Tag Heuer Men’s WAJ2112.BA0870 Aquaracer Calibre 5 Automatic 500M watch may be the way to go, with its push-button clasp. The Final Word: Priced at $2700, the easy scuffing of polished parts on the Tag Heuer Aquaracer CAF2111.BA0809 is a major drawback that I would not want to deal with after paying so much for a watch. Also, the fold over clasp may not be secure enough for intense high-sea expeditions. The watch is lovely and suitable for wearing out, but not on a daily basis at the office. This is a nice watch to add to your collection for fancy day or evening wear, but I would not suggest it for daily use.